Since we were so close to the Chicago area for Six Flags, we made a weekend of visiting my cousins who lived there. I hadn’t seen these cousins for about 10 years so it was great to meet up with them. Typically in Asian culture, when guests are visiting, the host really goes overboard in treating the guests well, and this was no different. My cousin Jesse and his family took us to some fantastic restaurants to stuff us silly, and also took us to visit some of the great places in Chicago. 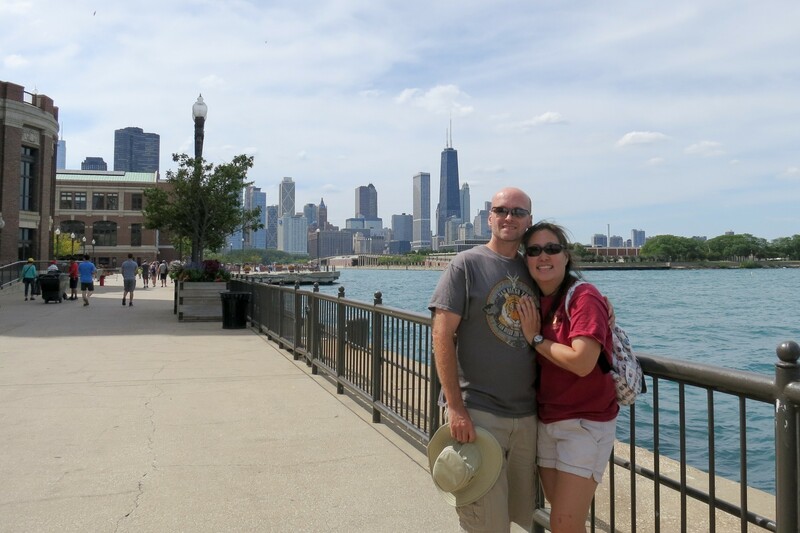 We visited the Navy Pier, a mile-long pier located on the shore of Lake Michigan and the number one visited tourist attraction in Chicago. The pier has both an indoor and outdoor section, and we brought Opie along since it was such a fabulous day. Dogs are allowed to walk the outside portion of the pier, plus Harry Caray’s restaurant has patio seating and allows dogs. Opie was on his best behavior and got a lot of smiles and petting from strangers. After lunch, Jesse and Opie sat outdoors while we walked the indoor area of the pier. The indoor had some nice shops, including an ice cream shop (we had to try that), and a small Tiffany stained-glass gallery (free). 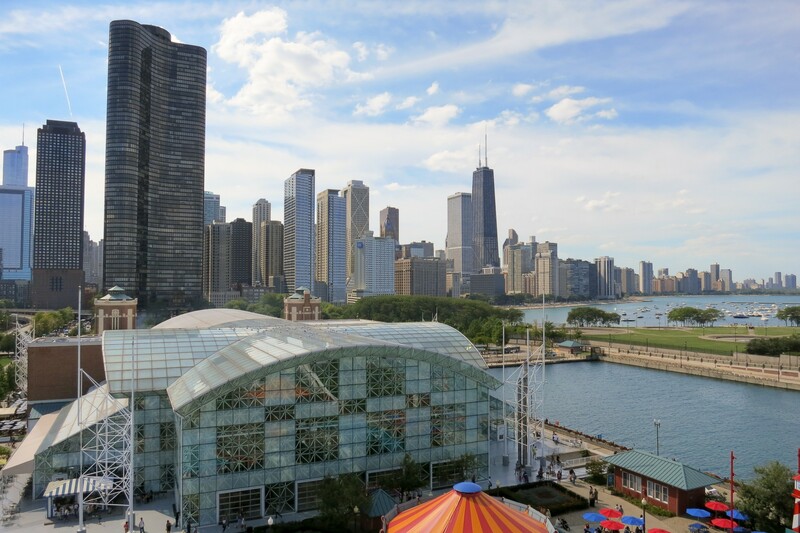 While at the pier, we had to ride the 150-ft tall ferris wheel which provides gorgeous and awesome views of the Chicago skyline (it’s much longer and prettier than I expected) and Lake Michigan, which is a humongous lake! While we were in line for the ferris wheel, I had the oddest sensation of deja vu. I finally realized that the Divergent movies were based in post-apocalypse Chicago! 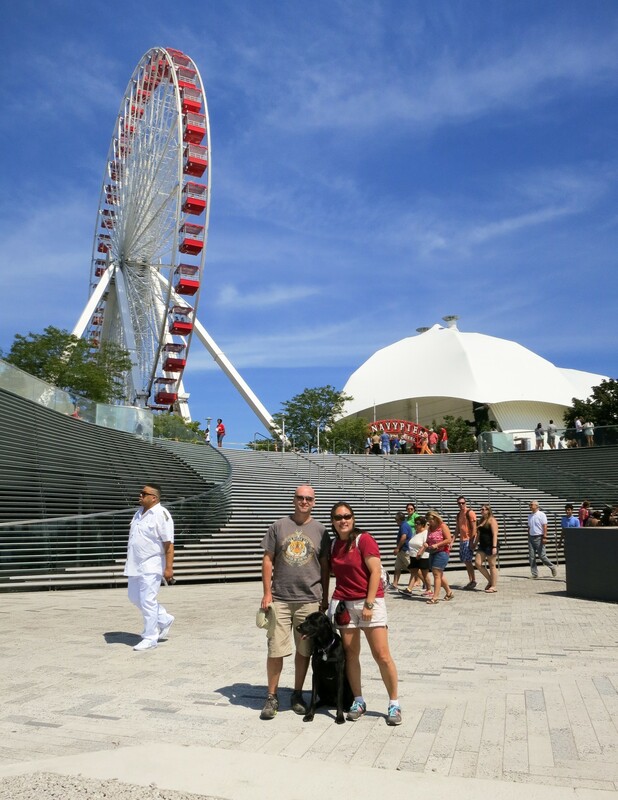 The scene in Divergent where they played Capture the Flag took place on the Chicago Navy Pier which is why the ferris wheel and the tower seemed so familiar. From the pier, you can also see the Chicago Harbor River Lock in operation. This is a pretty cool engineering feat, it’s used to keep the Chicago River lower than Lake Michigan which means the Chicago River flows backwards, away from Lake Michigan. This prevents sewage and contaminants from the Chicago River from poisoning the fresh water supply provided by Lake Michigan. The lock allows boats to transition between the higher waters of Lake Michigan and the lower waters of the Chicago River. We also took a nice tour of Chicago. 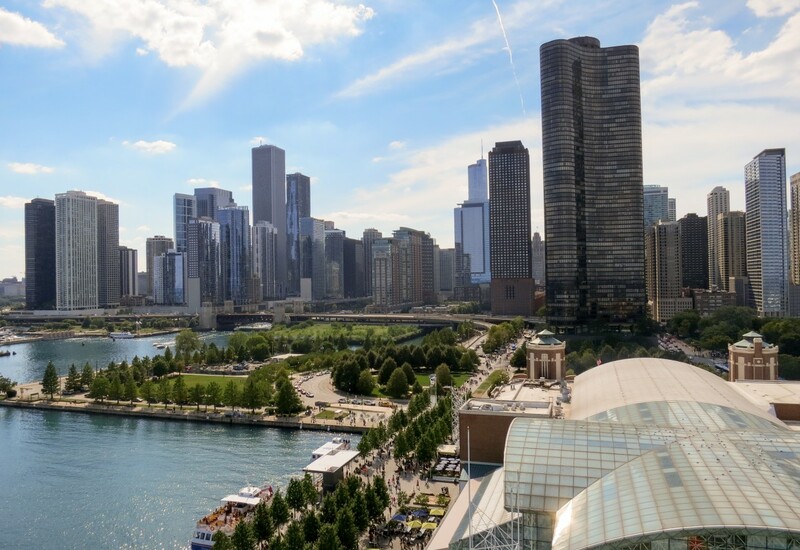 There’s a parkway that meanders alongside Lake Michigan with great views of the water and some of the swanky high-rises nearby. We even took a side trip to one of the beaches so I could stick a toe in…brrrr, water is cold in September. We wandered around old Chinatown, enjoyed some dim sum, and did some window shopping. Then drove along the Magnificent Mile, a nickname given to the upscale part of Michigan Ave. The road contains all sorts of fancy shops, restaurants, and hotels. I also got to see the Wrigley Building, the Tribune Tower, and the neat Chicago Water Tower. The weekend whirlwind tour of Chicago was a lot of fun, plus giving my cousin a hard time is always a bonus. Sometimes it’s nice having a knowledgeable tour guide when we hit a new place. After Chicago, we headed over to Elkhart, Indiana—RV capital of the World. 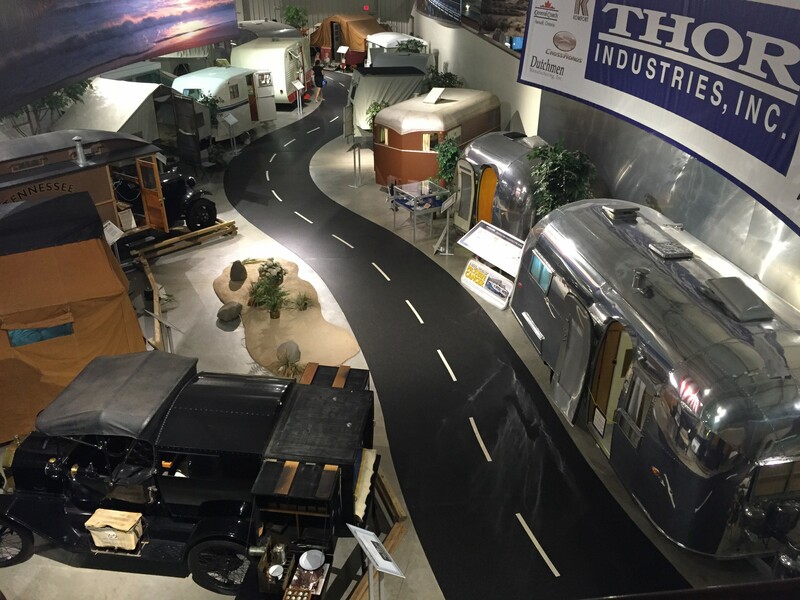 Elkhart is home to lots of RV manufacturers like Forest River, Keystone, Winnebago, and Thor (to just name a few). We visited the RV/MH Hall of Fame while we were here. When we first entered the parking lot, I asked Mike why would it be called RV/MH Hall of Fame since a motorhome (MH) is considered an RV making the name a bit odd. I didn’t even have to ask that question to the guide in the museum before he enlightened me. MH does not refer to MotorHome, but Manufactured Housing. Both the RV and MH industries have a common beginning, which was “affordable housing” which is why they share the museum. 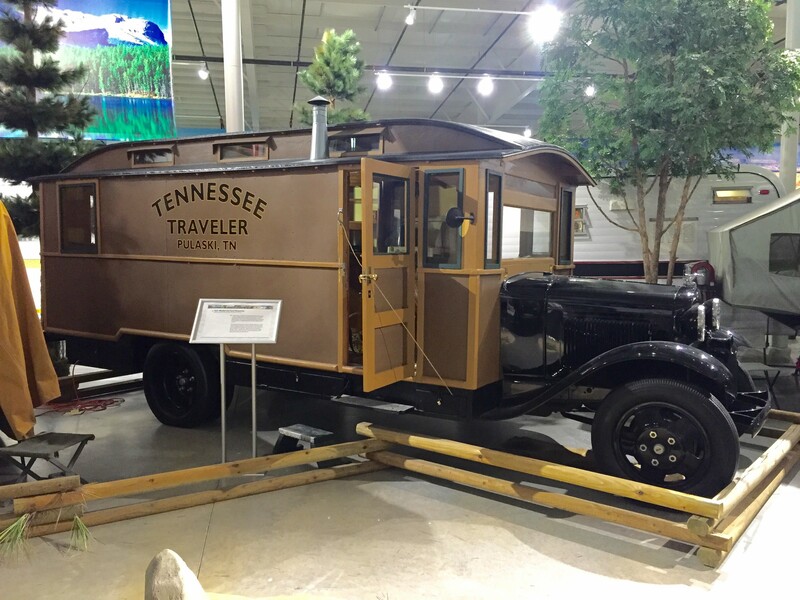 The museum houses some modern RVs, and also has section for old memorabilia including RVs, tents, and wagons from the early 1900s. This was definitely the coolest part of the museum. It turned out that Chris and Cherie of Technomadia were near Elkhart getting upgrades done on their classic bus. 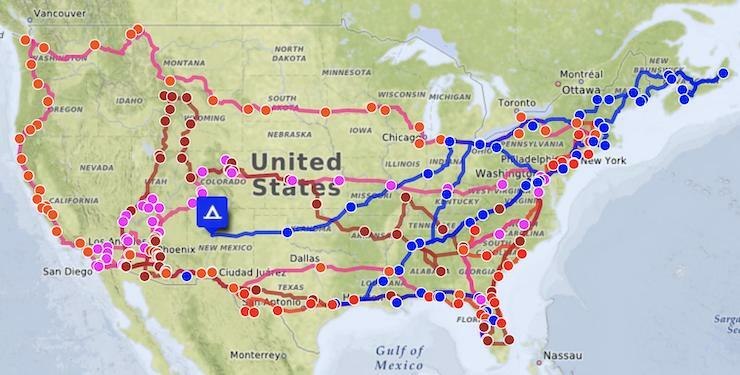 Their blog about being “digital nomads” was one of the full-time RV blogs we first started following when we planned on RVing and helped us figure out how to stay connected while on the road. We missed meeting up with them in Quartzsite AZ in January, so we asked them out for lunch in Elkhart and they accepted. We got to see their bus being repainted, met their cat Kiki and enjoyed a nice lunch and conversation. 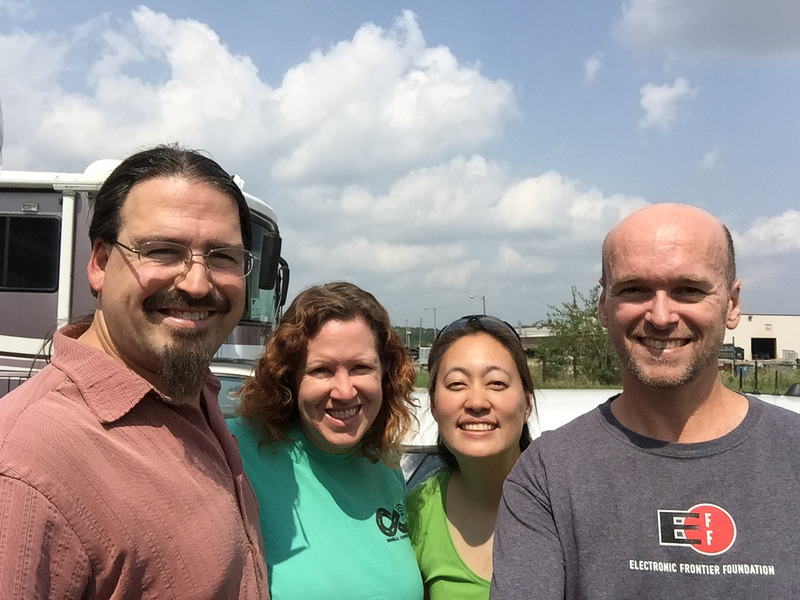 We always look forward to meeting fellow RVers and hopefully as we continue to travel, we’ll cross paths with the same folks more often. 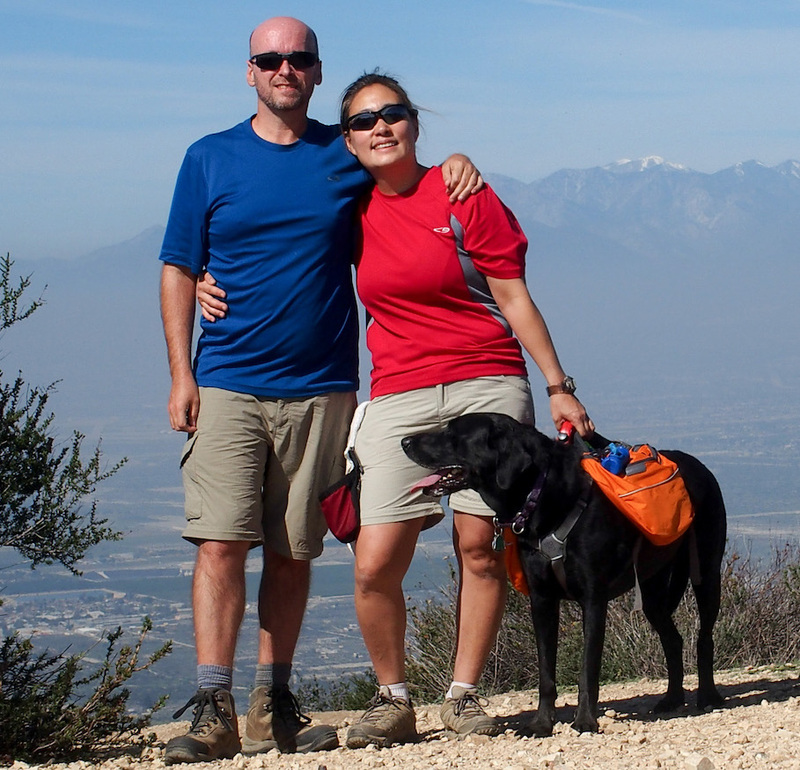 Since we haven’t been doing any major hiking recently, we thought it was time to have an Opie day out. 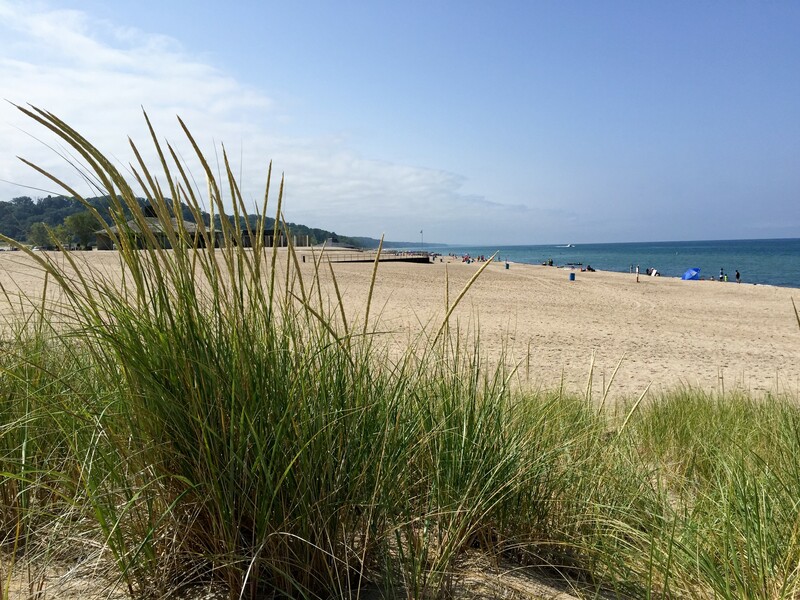 About 45 minutes away from our campground is Warren Dunes State Park ($8 out-of-state fee) with a really nice dog beach (on-leash). Half of the beach is for people only, and the other half allows dogs. It was a gorgeous day, the sand was soft and warm, the water nice and cool. All three of us had a great time walking the beach, while Opie would sniff (and pee) on everything. When he got too hot, he would wade into the nice cool water to get his ball. Opie traded nose touches with numerous other dogs and I think he enjoyed his day out. When we got home, Opie crashed hard on the couch and didn’t move for a few hours. It was a little weird being at a beautiful sandy beach hours away from any ocean! It looked just like a typical ocean beach, but with fresh water instead of salt and no seaweed. I think as we head back east, we’ve really been slowing down our activities. 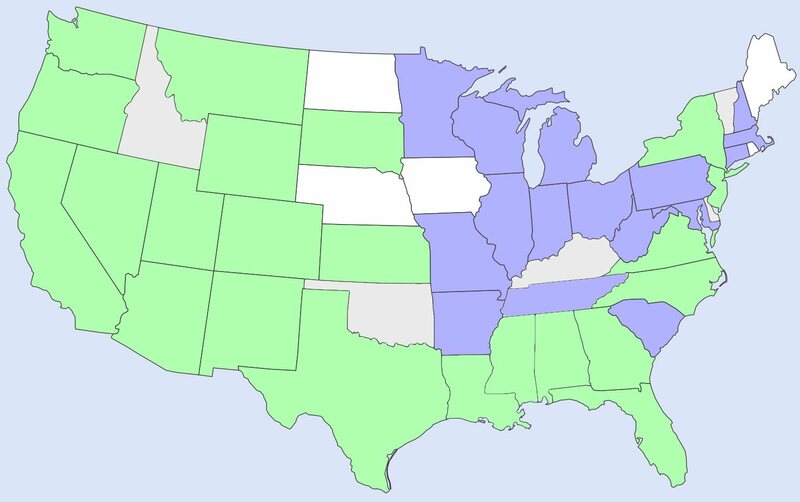 Some of it has to do with fewer national parks in the area, some with the cooler weather, and honestly some of it is because we’ve both become much more engrossed in our hobbies. Being introverts, it’s so easy for us to hole up in Rover before realizing that half the week is over and poor Opie hasn’t had any fun. To assuage my guilt, I may have to declare at least one “Opie day” per week moving forward.